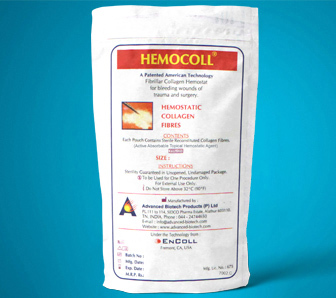 Hemocoll is high purity Type-I reconstituted collagen is intended for the surgical procedures. The benefits of Hemocoll as an adjunct to hemostasis when control of bleeding by ligature or conventional procedures is ineffective or impractical includes cardio vascular surgery & Neuro Surgery. After five to ten minutes, excess Hemocoll collagen fibres should be removed, either by teasing away or by irrigation with saline, followed by aspiration. If breakthrough bleeding occurs in areas of thin application, additional Hemocoll may be applied. The amount required will depend on the severity of bleeding. Hemocoll collagen fibre is derived from a bovine or ovine source and should not be used in patients with known sensitivity to such material. Do not re-sterilize. Hemocoll collagen fibre is sterile if the package is dry, unopened and undamages. Do not use if the package seal is broken. The device must be used prior to the expiration date. Discard all open Hemocoll collagen fibre and any unused portions. Hemocoll collagen fibre should be stored in a clean, dry location at room temperature. Do not store above 32°C to (90°F). Hemocoll collagen fibre has been sterilized with ethylene oxide gas. Hemocoll collagen fibre shelf life is 3 years.